"Kar Yong is deeply concerned about how the church in Malaysia should hear the parables of Jesus afresh. He rightly believes that the teaching of Scripture should not merely be reduced to personal application by individuals, but be heard and shared among a community that will move the whole church to action." Many books on the parables have been written. Why yet another book on the parables? How is this book different from the rest? First of all, I write as a New Testament specialist rooted in Asian soil, and as a pastor with homiletical eyes. 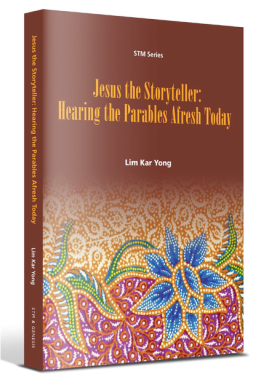 With this in mind, I attempt to offer relevant contextualisation for the Asian world, with the hope that it would be useful for readers who want to have a better understanding of what Jesus taught through his parables. The reader could be a busy pastor, a Bible study leader, a church leader or a serious Bible student. In addition, I also hope that those studying the parables in Bible colleges and seminaries find this book useful. At the same time, this book is written with the community in mind. We have lost much of what it means to read the Scriptures within a community, and allow the text to challenge us as a community. We are so used to listen to sermons that often offer us with the application, "What does this mean to me? ", and not "What does this mean to us as a church?" As such, much of the application of the teaching the parables in this book is directed towards the church as a community. Finally, at the end of each chapter, I have provided some discussion questions to help us better understand the parables and apply their teachings in our lives and communities. I trust that this could be profitably used by Bible study groups, cell groups, Christian education classes and anyone seriously studying the Bible. While this book is not intended to be a piece of academic work, it does include academic insight. Much of what I learnt about the parables is built on the works of other scholars. With this in view, I have tried to use simple language and kept technical jargon and extended footnotes to a bare minimum. When jargon is unavoidable, I have provided explanation of these words and phrases in the glossary found at the end of the book. Occasionally, I have referred to the Greek text of the New Testament when it is necessary, to bring out nuances that are not captured by English translations. This book has been a work in progress for many years. It is the result of the privilege of teaching and preaching the parables over the years that gives me much space and time to reflect on their meaning. I have taught elective courses on the parables at various seminaries of diverse traditions in Malaysia: The Bible College of Malaysia, a Pentecostal seminary; Seminari Theoloji Malaysia, an ecumenical seminary; and Malaysia Bible Seminary, an interdenominational evangelical seminary. These interactions with students from different traditions have made me rethink and relook at the parables from angles and perspectives that I had never seen before. The creative projects (assignments where students had to retell the parables from their own perspectives) also brought fresh insights in understanding the parables from an Asian, and more particularly, Malaysian context. At the same time, the great privilege of teaching in these seminaries has enriched my learning experience. For this book, I have occasionally drawn from the insights of my students, along with the questions asked and the informal discussions that continued after the class. In many ways, this book is a continuation of those conversations. I have preached and conducted seminars on some of the parables found in this book over the years. I have also written Bible study materials on the parables, which were used in cell groups for a local church. These opportunities have opened my eyes to see the relevance of the message of the parables for the church in Malaysia, and beyond. For those residing in Malaysia, please get in touch with me for pricing and ordering information by filling up the form. Alternatively, you may enquire with fine local Christian bookstores. For those outside of Malaysia, you may order directly from the publisher, Armour Publishing or Amazon.